Every year, there are two equinoxes. One is in March; the other is in September. On the equinoxes, the sun shines directly on the equator and the length of day and night is nearly equal. Seasons are opposite on either side of the equator, so the March equinox is called the spring (or vernal) equinox in the northern hemisphere. But in the southern hemisphere, it's known as the fall (autumnal) equinox. What do equinoxes look like from space? The Spinning Enhanced Visible and Infrared Imager (SEVIRI) on EUMETSAT's Meteosat-9 captured this view of Earth from space. 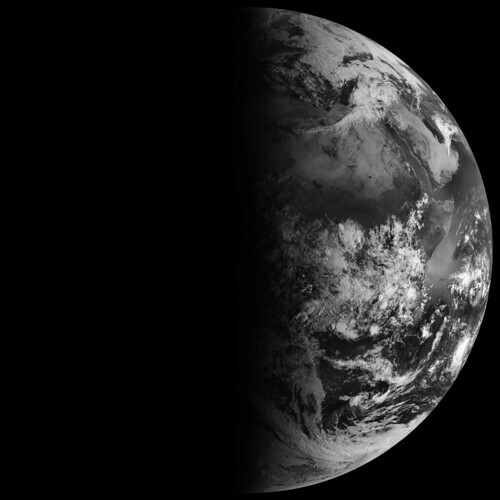 The images show how sunlight falls on Earth on the vernal equinox. Notice how the terminator — the divide between day and night — is a straight north-south line, and the Sun is said to sit directly above the equator. Equinox means "equal night" in Latin, capturing the idea that daytime and nighttime are equal lengths everywhere on the planet.